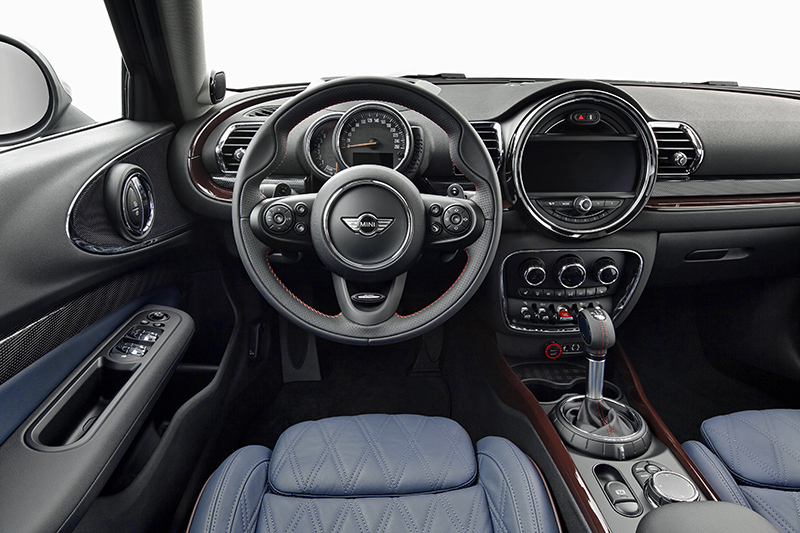 The new MINI Clubman also offers numerous features that appear in an automobile of the brand for the first time for increased driving fun, comfort and safety. These include the electric parking brake, the electrical seat adjustment function available as a special equipment feature and the option MINI Yours Interior Styles with backlit door bezels. The MINI Excitement Package comprises LED interior and ambient lighting as well as a projection of the MINI logo onto the ground from the exterior mirror on the driver’s side when the car is opened and closed. Another new feature that is unique within the competitive field is the Comfort Access option including non-contact opening of the split doors at the rear. Other options available for the new MINI Clubman include LED headlamps, the MINI Driving Modes and Dynamic Damper Control. For the first time, the new MINI Clubman combines the characteristic brand interpretation of this concept with the functional qualities of a modern automobile in the compact segment. With a length of 168.3 inches, a width of 70.9 inches and a height of 56.7 inches, it has distinctive proportions that make it unique within both the brand’s model program and the compact segment as a whole. The wheelbase measures 105.1 inches, while the track width is 61.6 inches at the front and rear. These dimensions provide the ideal basis for a stylish, individual and exclusive appearance, agile driving properties and – thanks to clever space utilisation in typical MINI style – a roomy interior as well. Classic design features and the emotionally appealing styling indicate the kinship of the new MINI Clubman as part of the brand’s model family while at the same time setting it clearly apart from its competitors. 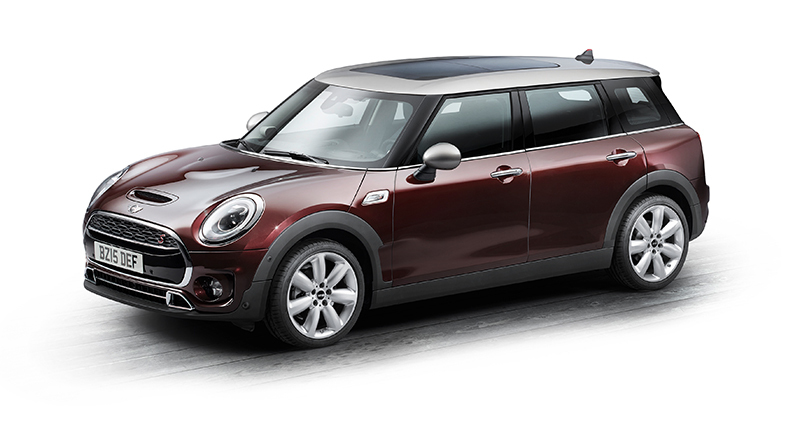 Circular headlamps with chrome surrounds, the hexagonal contours of the radiator grill and the vigorously arched power dome of the engine compartment lid define the front view in characteristic MINI style. The lower air inlet is particularly wide, thereby highlighting the car’s solid stature. The bumper trim, also serving as a number plate carrier, is finished in high-gloss black. In the MINI Cooper Clubman model, the section of the radiator grill above this is subdivided by three black ribs. 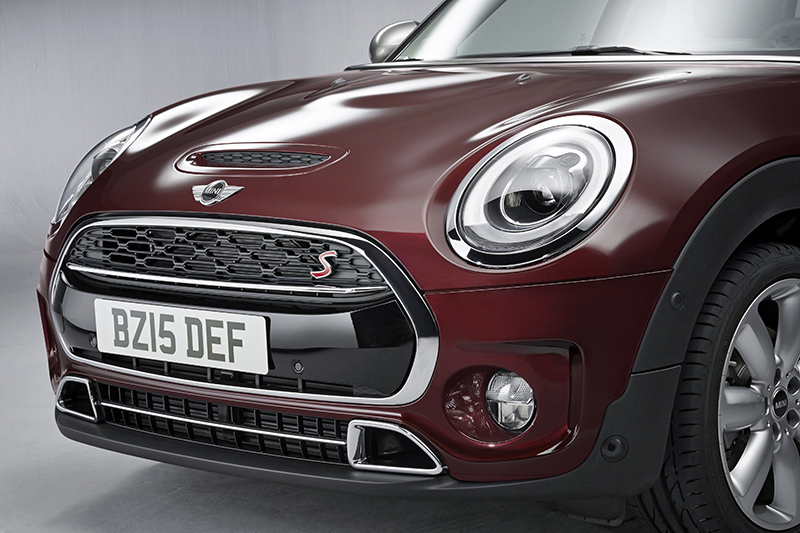 The radiator grill of the MINI Cooper S Clubman has a chrome rib bearing a red “S” logo with a chrome surround. What is more, this engine variant can be recognised by the distinctive shaping of its front apron including a trim strip in high-gloss black and an additional opening in the engine compartment lid. With the new MINI Yours Interior Styles option, this striking door trim design is highlighted by means of indirectly illuminated decorative strips. They are combined with interior trim finishers available in various types. The optional lighting package with LED interior and ambient lighting also creates an atmospheric ambience. In conjunction with the special equipment feature MINI Excitement Package, this offers continuously variable color changes and has also been extended to include a light display that is activated when opening and closing the car. On activation of the remote key, the MINI logo is projected onto the ground for 20 seconds from an additional light source in the exterior mirror on the driver’s side. Another new option is the electrical adjustment of the driver and front passenger seats, including memory function on the driver’s side. For the first time, seat height, longitudinal position, seat surface angle, backrest angle and lumbar setting can be adjusted at the press of a button. A wide range of individualization options are available with the model-specific selection of upholstery colors, interior surfaces and the optional Chrome Line for the interior. As an alternative to the standard fabric, the seat surfaces are also available in fabric/leather combinations and leather finishes with various seam patterns. 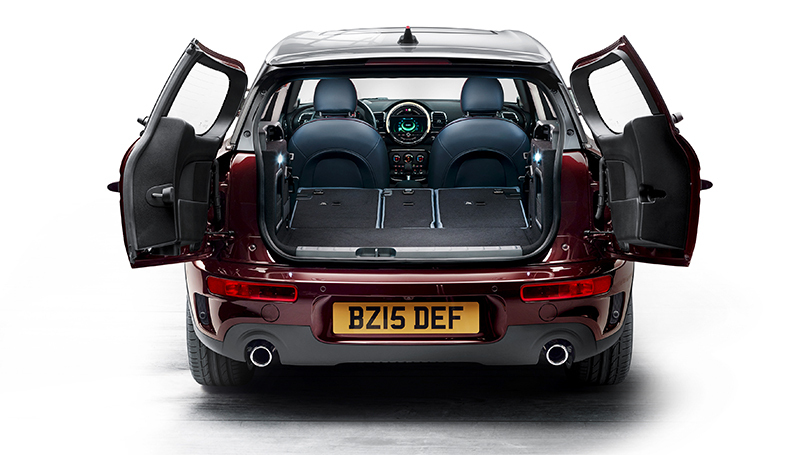 The MINI Cooper S Clubman is fitted with sports seats as standard, and these are available as optional extras for the other models. Alternatively there are also John Cooper Works sports seats. The optional MINI Driving Modes are activated by means of a rotary switch at the base of the gear or selector lever. In addition to the standard MID mode there is a choice of SPORT and GREEN mode. In SPORT mode, the accelerator pedal characteristic curve and steering are switched to a sporty set-up, as are the shift times in cars fitted with Steptronic transmission. In GREEN mode, a more relaxed and also more fuel-efficient driving style is supported by intelligent control of energy and climate management as well as by means of systems such as shift point display. In cars fitted with Steptronic transmission it is also possible to use the coasting function. The drivetrain is decoupled at speeds above 30 mph as soon as the driver’s foot is removed from the accelerator pedal. The new MINI Clubman then rolls at idling engine speed with a minimum rate of fuel consumption. The large track width and long wheelbase of the MINI Clubman benefit the model-specific design of the suspension. What is more, new development of all front axle parts has resulted in optimisation of kinematics and component stiffness. The car’s weight has been reduced by the use of aluminium swivel bearings as well as front axle supports and wishbones in highly rigid steel. The particularly stiff wheel suspension on the rear axle also enhances the agile handling properties of the MINI Clubman. In addition, spatial economy is achieved by the separate arrangement of springs and dampers, impacting positively on the room available at the rear and in the luggage compartment. Thanks to the brand’s typical combination of single joint strut axle at the front with a multilink rear axle and the model-specific interpretation of this structure, the new MINI Clubman has suspension technology that is unusually sophisticated for the compact segment, too. In conjunction with the power transmission to the front wheels and the low center of gravity, this construction principle provides the perfect basis for the agile handling known as the go-kart feeling. Electromechanical power steering including speed-related steering assistance as standard also contributes to the car’s precise driving properties. The integrated MINI safety concept also includes a standard fitting of six airbags, three-point automatic belts on all seats including belt tensioners and adaptive belt force limiters at the front and ISOFIX children’s seat attachments at the rear tire pressure display for each individual wheel is also included as standard. As compared to its predecessors, the Mini Clubman Estate had grown by another 3.9 inches to an exterior length 11.2 feet. Modern functionality in the interior was provided in the form of new circular instruments: these replaced the speedometer positioned centrally in the dashboard and were now placed behind the steering wheel – directly in the driver’s line of sight. The basic concept remained, consisting of short overhangs and widely set wheels, front-wheel drive and a transversely installed 4-cylinder engine at the front, while the output was increased from 34 to 39 hp. The Mini Clubman Estate remained in the program until 1982, and a total of 197,606 of this compact all-rounder were manufactured during this period. Behind the two rear doors, a luggage compartment was revealed that could be expanded to a volume of 32.8 ft3 by folding down the rear backrest. And that was not all: on the right-hand side the MINI Clubman featured an additional door that provided increased functionality in unconventional style. The rear-hinged so-called Clubdoor gave rear passengers a particularly convenient entrance and exit – stylish, unique and perfectly suited to the car’s generous leg room, which had increased by eight centimetres as compared to the three-door MINI. 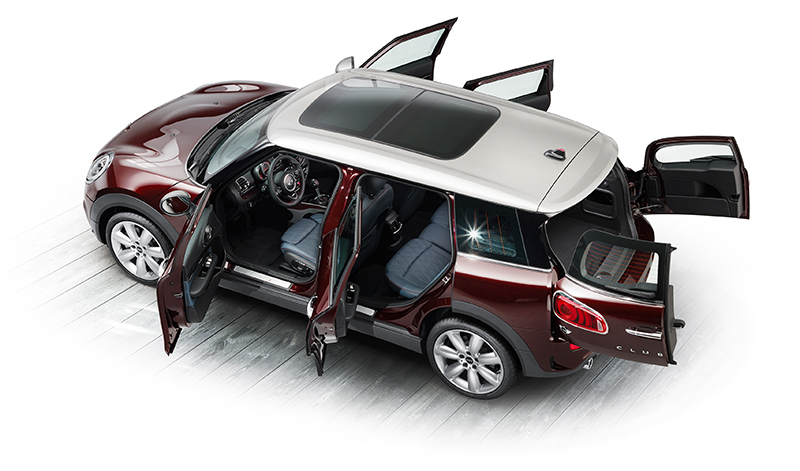 The MINI Clubman was also available with three rear seats on request.